Today a slightly hungover L9OBL brings you all the wonders that happened this past week. Why slightly hungover? because reasons, that’s why. This week we worked on lots of art, which is our usual schtick. We also have been doing convention prep. Planning for the 2019 conventions we want to go to. No official announcements yet, but applications have been submitted! So keep an eye out for that. Lastly let’s talk about books! No there aren’t any books close enough to put a date on them. We are hoping for something in December, but don’t hold your breath. Our big goal is to have two books out by April 2019. Until Next week Dead Tree Fans! Be sure to leave a comment, check out our Facebook, Instagram, Twitter and Discord as well as our Patreon. And as usual, be careful, it’s a wasteland out there! We are back at it with another Dev blog! How long has it been since our last one? Nobody knows! What is known however is all the cool things which happened over the last month or two. Mostly work. That’s right! Our broke selves worked like dogs at our day jobs! It wasn’t as fun as it sounds. we also worked on a LOT of art for the Locked safe and the Martial Art’s guide. The Bestiary got EVEN MORE monsters to it because we made the fatal mistake of putting a mad woman with hate for living player characters in charge of making mobs (as GMs we couldn’t be more delighted). We also attended Ciderfest and Derpycon. Both were massive hits, despite us being a little understaffed. Thank you to everyone who showed up to our games and vendor’s tables at both cons! That’s everything for now! Until Next week Dead Tree Fans (unless we work more 80 hour weeks)! Be sure to leave a comment, check out our Facebook, Instagram, Twitter and Discord as well as our Patreon. And as usual, be careful, it’s a wasteland out there! This week’s Dev blog won’t be super long as really all we have done is Art. Art, and more art, and even MORE art. Mainly weapons for the System Compendium. Also some for the Martial Arts guide. Also Moon will be heading to Derpycon south and Ciderfest this month. He will have both a vendor’s table and a Games room table. So look forward to that! As he will be peddling both back alley crits AND awesome FoE PnP books! That’s everything for this week. Until next week Dead Tree Fans! Be sure to leave a comment, check out our Facebook, Instagram, Twitter and Discord as well as our Patreon. And as usual, be careful, it’s a wasteland out there! Sorry about the delay, unfotunately L9’s day job has him working like a dog and he hasn’t been able to update the Dev Blog like planned. However this weekend is Canadian Thanksgiving so he has a modicum of time off to contribute to the dev blog *yay*. Things that have happened since the last dev blog. Lots of art and book formatting for the Martial Arts Guide and Bestiary. Also the Public release of the Game Master’s guide is happening today, so be excited for that! Emails should be sent out today, and books should be mailed out within the week. Greetings Dead Tree Fans, these last few weeks have been rather tumultuous. Mainly for L9 our project manager (who also writes all the Dev Blogs), as he spent a week without internet, and has been without power since Friday sue to a tornado taking out his local power substation. Fun. Though that all seems to be sorted for now. So, for those of you chosen to be overmares, expect to receive your Stable-Tec issued Overmare’s Guide to Duty in the coming weeks. Other things that happened were art, and… well more art. For both the next book, looking to be the Martial Arts guide, and the System Compendium. The bestiary keeps getting larger and more terrifying… as if some mad floof has gotten hold of the manuscript and is running wild with monsters of Party Annihilation. That seems to be everything for now. Until Next week Dead Tree Fans! Be sure to leave a comment, check out our Facebook, Twitter, Instagram and Discord as well as our patreon. And, be careful, it’s YOUR wasteland out there! We are back with our weekly Dev Blog. Big things sorta happened since our last dev blog. to start we have returned from DragonCon, Which was a lot of fun. We took a bunch of pictures and have been uploading them to our Instagram @dead_tree_studios . We mostly attended relevant panels and did research for our next game. There were a lot of cool things happening, and we ultimately had a productive week, despite about 90% of it being spent waiting for elevators. Enjoy a picture of Zen, our Game Developer, flaunting the reason we got denied entry to a Hard Rock Cafe. Other than that, we worked on art and ordered our next round of books, including our Game Master’s guide. Those should arrive soon, hopefully. Next book on our release line up is: “Hooftycuffs: A Martial Arts Guide” Featuring over 20 different Martial arts to master, lore and history about both, and a character sheet for the “current” masters of each style. We are aiming to have it finished by the end of September/beginning of October. Until next week Dead Tree Fans! Be sure to leave a comment, check out our Facebook, Twitter and Discord (and Instagram!) as well as our patreon. And as usual, be careful, it’s a wasteland out there! DragonCon Set Up: We have been prepping to go to DragonCon 2018 and Strut our stuff, we don’t have any reserved games tables or events or anything, but we will be around for back alley crits and any walk in table reservations that the con may have. Book stuff: The Game Masters guide is still undergoing its pre-print set-up on Ingram spark. For some reason things have been taking quite a while and have had a significant amount of issues. Hopefully we can get orders placed before DragonCon, though it looks like non-indiegogo/patreon orders will need to be delayed a couple weeks. We’ll keep you updated. Art: Lots of art got done, both for the Locked Safe, and Hooftycuffs our martial arts guide, which is looking to be our next release. The goal is to have it done late September, early October, with the Beastiary out around November and the Locked done in December. How off the mark those estimates are? Hopefully not too much. Until Next week Dead Tree Fans! Be sure to leave a comment, check out our Facebook, Twitter and Discord as well as our patreon. And as usual, be careful, it’s a wasteland out there! My name is Curly Cabbage, the Chief Officer of Fringe Arcano-Science at Stable-Tec. You are receiving this message because you have been selected to participate in vault 112. Please register with Stable-Tec to secure your place today! 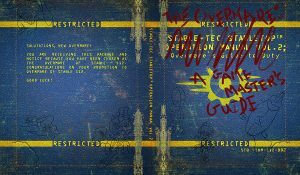 Vault 112 will be officially open and completed in mid September, though Stable-Tec selected V.I.P.s have already been issued their pip-buck, barding and manual. We look forward to keeping you safe and thank you for choosing Stable-Tec. As you read above, our Game Master’s guide titled: The Overmare is complete and has been sent off to the printer! Indigogo and Patreon supporters have received their digital copies already, and the Game Master’s guide will be available to the general public come mid-September! This last week we went to GenCon and had an absolute blast! No tables or exibitor spaces were had, as we mostly went to explore and meet people. But we did run a game which had 16 people show up to play. A special shout out to the two awesome ladies cosplaying as Zone-tan and Shadman. 11/10 best cosplay at GenCon, would let you watch us fap again. 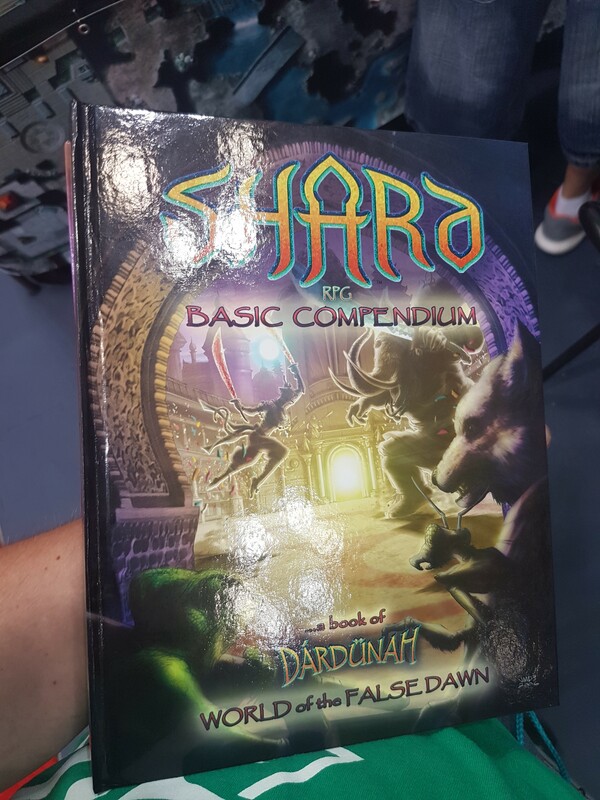 Additionally we met the really awesome people from Shard Studios, who make the Table Top RPG “Shard RPG” which is an awesome story telling based Table Top game set in the world of Dárdünah, an amazingly vast high fantasy world inspired by Indian culture and mythos. We highly suggest checking them out on their website HERE. Both the game and the people behind the game are extremely fun and awesome and deserve your love and attention. Unfortunately L9OBL is horrendous at taking photos, so he stupidly didn’t think to get a group photo. Though Zen seems to have come through with a photo of Yishai, the game tester, and his awesome hairdo. Now, with the shilling of things we adore done (who are we kidding, the shilling is NEVER DONE! ), lets move on to the rest of what happened this week. Things that have happened that we haven’t talked about yet are: more art, as usual. Not only for the Locked safe, but after many years of ignoring it, L9OBL has started putting in actual art on the Convention Circuit pre-gen characters, instead of drunkenly stolen art from google. We also worked out the majority of the lore that will be present in our next Game we are making. The inspiration to do so, largely because of Shard Studios and their 10,000 years of lore and the immeasurable amount of passion they have for their game. What can we say? Passion is contagious! Also, 10+hr road trips. Lastly, there have been some website maintenance and overhauls. Mainly to fix a lot of the breaking from mobile view.